If you are going to live or visit Indonesia, please take the time to tell our Embassy in Jakarta or Consulate in Surabaya about your trip. If you enroll in the Smart Traveler Enrollment Program, we can keep you up to date with important safety and security announcements. It will also help your friends and family get in touch with you in an emergency. Local embassy information is available below and at the Department of State's list of embassies and consulates. U.S. Embassy Jakarta is located at Medan Merdeka Selatan 5, Jakarta 10110; telephone: (62)(21) 3435-9000; fax (62)(21) 385-7189. The most secure international mail address is: U.S. Embassy Jakarta, DPO, AP 96520 USA. The consular section of the Embassy can be reached by e-mail. Instructions on how to receive SMS emergency messages on your cell phone can be found on the Embassy's FAQ page. U.S. Consulate General in Surabaya is at Jl. Citra Raya Niaga No. 2, Surabaya 60217; telephone: (62) (31) 297-5300; fax (62) (31) 567-4492, after-hours duty officer (62) (811) 334-183. The consulate can also be reached by e-mail. The consulate should be the first point of contact for assistance to U.S. citizens who are present or residing in the Indonesian provinces of East Java, Nusa Tenggara Timor, Nusa Tenggara Barat, all of Sulawesi and North and South Maluku. There is a Consular Agency in Bali at Jalan Hayam Wuruk 310, Denpasar, Bali; telephone: (62) (361) 233-605; fax (62) (361) 222-426; or BaliConsularAgency@state.gov. The U.S. Consulate in Surabaya is an alternate contact for U.S. citizens in Bali. The American Presence Post in Medan, North Sumatra, provides only emergency assistance to U.S. citizens and does not offer routine consular services. U.S. citizens needing emergency consular assistance in Sumatra should call (62) (61) 451-9000. ENTRY / EXIT REQUIREMENTS FOR U.S. CITIZENS: You will need a passport valid for at least six months following the date of your arrival to Indonesia. The U.S. Embassy cannot obtain entry permission for U.S. citizens with expiring passports. If you arrive and your passport has less than six month's validity, Indonesian authorities will require you to depart Indonesia immediately to obtain a new U.S. passport elsewhere; you will not be allowed to renew your passport here and follow-up later with Indonesian authorities. Also, if your passport does not have the required six month's validity remaining on your passport, you may be denied boarding at your point of origin or at a transit point en route. Generally, you should expect to wait two weeks for a U.S. passport to be issued outside of the United States. 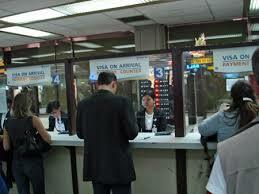 You are required to have a visa to enter Indonesia, obtained either beforehand oron arrival. Tourist passport holders traveling for private purposes may apply for a 30-day visitor visa on arrival at the airports in Jakarta, Bali, Surabaya, Banda Aceh, Medan, Padang, Pekanbaru, Manado, Biak, Ambon, Balikpapan, Pontianak, Kupang, Batam, and South Sumatra. Visas-on-Arrival are also available at a limited number of seaports, including the Batam and Bintan ferry terminals opposite Singapore, but they are unavailable at any land border crossing. Visas-on-Arrival are only for private, temporary business or pleasure visits. Visas-on-Arrival are valid for 30 days and cost U.S. $25. A Visa-on-Arrival may be extended one time only. An onward/return ticket is required to apply for a Visa-on-Arrival at these ports of entry. The Indonesian Embassy website indicates that Visas-on-Arrival are unavailable to government travelers who want to enter Indonesia on a diplomatic or official passport for an official purpose or mission. Travel for other purposes requires the appropriate Indonesian visa before arrival. For details on Visas-on-Arrival and other visa information please visit the Embassy of the Republic of Indonesia website. If you are entering Indonesia through Bali, you must have two fully blank passport pages in your passport. If you are entering through other ports of entry, you must have at least one blank page. Indonesian immigration inspectors do not consider amendment pages in your passport as blank pages. If your passport is nearly full, be sure to obtain extra blank passport pages before you travel - go to How to Add Extra Pages to Your U.S. Passport. If you don't meet Indonesian entry criteria properly, you may be denied entry on the spot with no recourse and put on the next available flight departing Indonesia. Please be advised that Indonesian entry and visa procedures may be inconsistently applied at different ports of entry, and when faced with making a decision, Indonesian authorities usually make the more conservative, restrictive decision. Entry requirements are subject to change at the sole discretion of the Indonesian authorities, a process over which the U.S. government has no control. You may apply for a visa at the Indonesian Embassy in Washington, D.C., or at an Indonesian consulate elsewhere in the United States. In some cases, you may also apply at Indonesian embassies and consulates in other countries. If you are traveling overseas and wish to apply for an Indonesian visa, you should inquire with the local Indonesian embassy in the country where you are currently traveling. For up-to-date information, travelers may contact the Embassy of the Republic of Indonesia: 2020 Massachusetts Avenue NW, Washington D.C. 20036, phone: (202) 775-5200, or at Indonesian Consulates in Los Angeles (213) 383-5126; San Francisco (415) 474-9571; Chicago (312) 920-1880; New York (212) 879-0600; and Houston (713) 785-1691. Visit the Embassy of Indonesia website for the most current visa information. Indonesia strictly enforces its immigration/visa requirements. Travelers who overstay the date stamped in their Visa-on-Arrival are subject to a fine of 200,000 Rupiah, approximately U.S. $22, per day, and other sanctions. Westerners, including U.S. citizens, have been jailed for visa violations and/or overstays. Violators may also be subject to substantial fines and/or deportation from Indonesia for immigration and visa violations. Immigration officials have also detained foreigners for conducting work, academic, or other non-tourist activities while on visitor status. Even gratis volunteer work with local or international NGOs is not permitted on visitor status. Penalties for such immigration/visa violations have included a prison sentence of up to five years and a fine of Rupiah 25 million. Travelers should contact an Indonesian consular office to determine the appropriate visa category before traveling to Indonesia. Please consult the Criminal Penalties section below for further information. All airline passengers, including children, diplomats, and officials, are subject to a departure tax, which must be paid in Rupiah, cash only. The international departure tax as of August 2012 is 150,000 Rupiah in Jakarta and varies at other international airports. The domestic departure tax in Jakarta is 40,000 Rupiah and also varies elsewhere. The U.S. Department of State is unaware of any HIV/AIDS entry restrictions for visitors to or foreign residents of Indonesia. The Indonesian Government screens incoming passengers in response to reported outbreaks of pandemic illnesses.